I didn’t get to spend much time in Kansas City, Mo., this week; my trip was literally a flying visit – in and out. Which was a pity, because the event I was speaking at – the Business Communicators Summit, organized by KC/IABC (see this lovely write-up by Justin Goldsborough), was held at the National World War I Museum at Liberty Hall. It’s an awe-inspiring edifice, and I have every intention of going back so that I can actually see it. One of the things I did see – and that stopped me in my tracks – was the field of 9,000 poppies that you look down on when you enter the museum, through a glass panes in the floor. 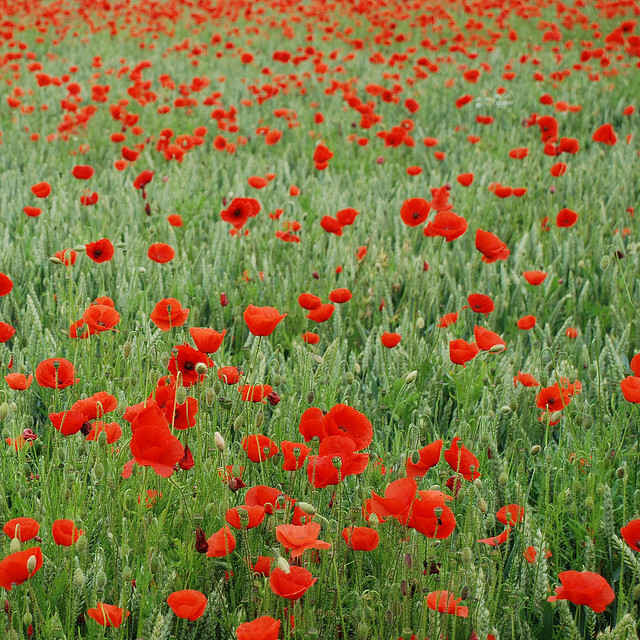 Nine thousand poppies; one for every thousand people who died in World War I. With the recent passing of Frank Buckles, the last known American veteran of WWI, today’s roundup takes a break from PR and social media blather; instead, I wanted to share a few great blogs/posts I found related to the Great War. 1. Harry’s letters about the Battle of Messines Ridge, from WWI: Experiences of an English Soldier. Why: Harry Lamin was an “ordinary” Englishman who served in the war. His letters home to his brother and sister were handed down to his grandson, who used them to compile this blog, exactly 90 years after they were written. 2. Diary Entry – 28th February, 1916, from the Diary of EW Manifold – WWI. Why: similar to Harry Lamin’s blog, this too is a blog consisting of diary entries compiled by the grandson of a WWI soldier – Edward Walford Manifold. This soldier, however, was Australian. 3. The last man standing, from mental_floss. Why: Sparked by the death of Corp. Buckles, this takes a look at the last survivors of previous wars. 4. An interview with Frank Buckles from LOST Magazine. Why: His own words, as told to the writer. 5. Frugal recipes from World War I, from Hillbilly Housewife. Why: I doubt any of us have experienced the kind of hardship people did during WWI, when rationing meant more than how much time one would spend on the Internet. It’s fascinating to see how people made do with what they had to come up with tasty food. 6. Clothes styles during the first World War 1914-1918, from Fashion-era. Why: so much of the looks we take for granted – particularly for women – can be traced directly back to the Great War. 7. How women helped win the Great War, from the U.S. Army’s website.